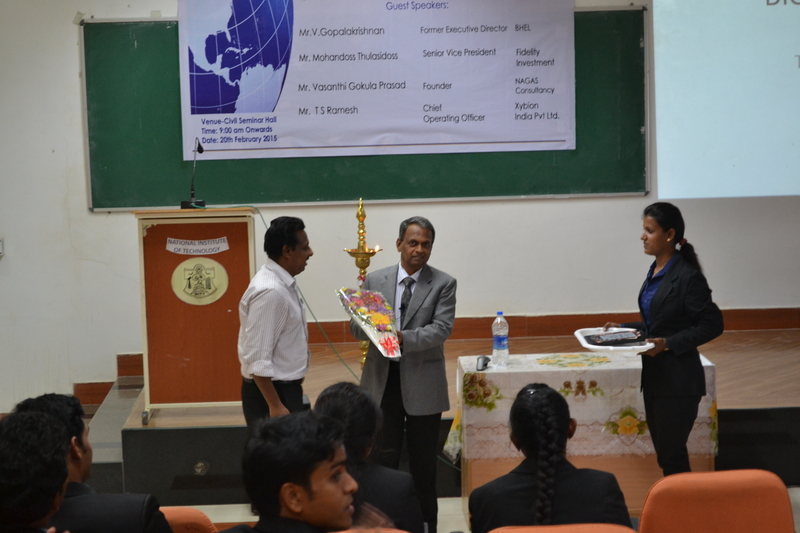 Prabandh, the much awaited General Management Conclave, organised by Department of Management Studies, NIT Trichy, was held on 20th February, 2015. Every year in February and August, the event is organised with much dedication and spirits, inviting eminent speakers from different industry dom ains to make the students aware of the latest business world scenario and happenings in the business sphere. Firstly, Dr. V. Gopalakrishnan, Former Executive Director, BHEL addressed the gathering. It was a great honour to have him with us to deliver his lecture on “Leadership in 21st Century”. He talked on how IT has changed the leadership style from the past era to the present making it more transparent yet challenging. He illustrated his real life industry experiences and cited how things changed and are continuously evolving each day. Learning from the lens of an elderly and experienced person, he projected to the students that simplicity, patience and compassion are the three most essential tools to succeed in life. His knowledge imbibe in the students the values that are essential for a manager in the long run to sustain in the ever growing competitive world. Secondly, Mr. Mohandoss Thulasidoss, Senior Vice President at Fidelity investment, gave us an insight about the intelligence age and how one should equip oneself for the same. The evolutio n that started with the agricultural age, moved to industrial age, followed by the current information age and rapidly making a move towards intelligence age was explained with apt examples. Further, he explained how technology has empowered today’s generation to be more informed. 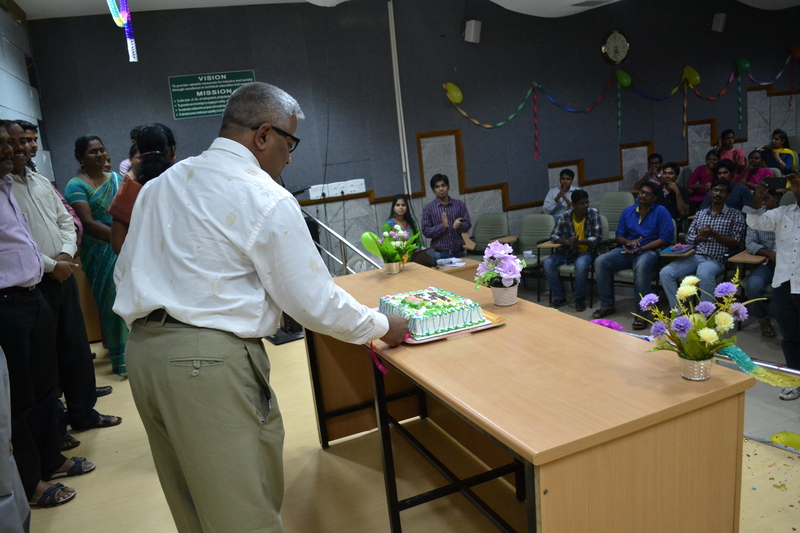 To follow, we had Mr. Vasanthi Gokula Prasad, Founder, NAGAS Consultancy, who excels in the HR domain. 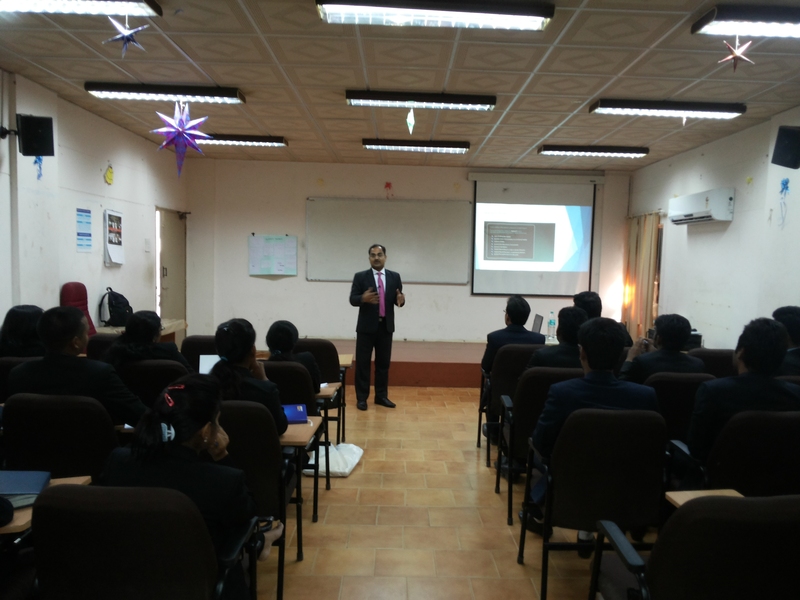 He spoke about talent acquisition, talent management and the various challenges attached with the same. Talent acquisition and management are both the sides of the same coin, neither of which is an easy task. The last speaker, Mr. T. S. Ramesh, Chief Operating Officer, Xybion India Pvt. Ltd. acquainted us with the ever growing power of digital marketing. In the current business environment , the word digital has almost replaced traditional, so is true in marketing. He equipped us with the requisite knowledge in this field and also made us aware about the various tools for its application. Indeed, Prabandh not only provides a platform to all the DoMSians for knowledge sharing and interaction with reputed people from various industries, it also gives the students the exposure that is important for the holistic development of a management student. The year 2014 passed by like a cool breeze of air, leaving us at DoMS, awestruck with wonderful memories that we would cherish for the rest of our lives. 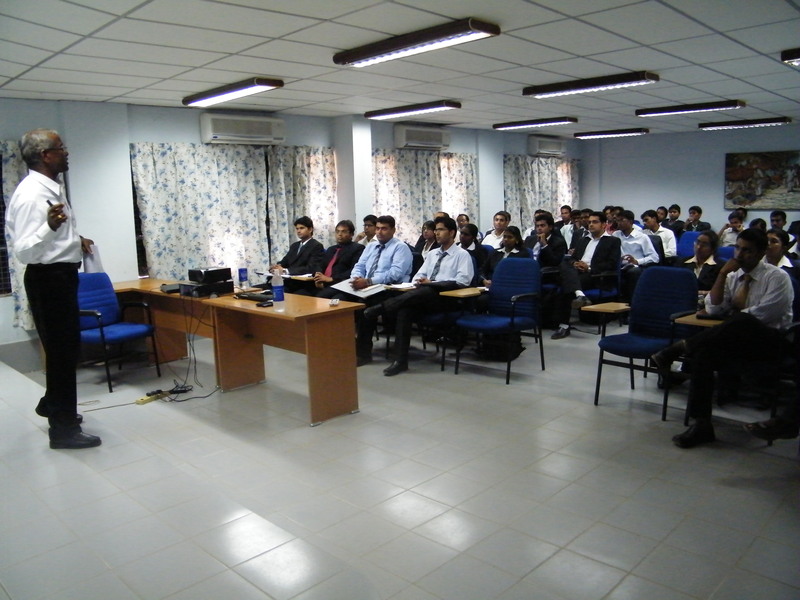 It still seems like yesterday when the 36th batch of DoMS had entered the much sought after arena of pursuing MBA. 2014 began like a roller coaster ride, full of fun-filled learning and lots of other festivities. The year started with the welcome of the 36th batch into the DoMS family which shares a bond of love and sense of belongingness among its members. The onboarding program included FIRM games which were not only exciting but also gave us friends for life. The various games helped intermingling of 35th and 36th batches which now work like one big racing team in the adventurous ride called MBA. It filled juniors’ hearts with warm joy to see how seniors stood up with them, guided and made them feel at home. Of course! A home-away-from-home. FIRMs were a good ice breaker. Up next was the much awaited Freshers’ Party where the junior batch was made to feel that they were one of their kind, special and adorable. If every human being loves to feel special, it was exactly what we felt while walking through the hallway with showers of welcome, blessings in flowers from the senior batch amidst hooting and applaud. It all felt like being the tinsels glowing and gleaming in our charm and glory. Teachers’ Day celebration were the next event in our journey at DoMS. The students performed various events as a mark of respect to their teachers. The energy that enthralled the A13 hall was immense and the sight of this event was worth watching. The guest lectures and Analytics’ Conclave- ‘Prabandh’ filled whatever was left of the first trimester. The fervour and zeal to perform better and devour more knowledge increases with time and learning. The same got imbibed in all of us. The advent of 2nd Trimester brought with itself the EXCITEMENT to do better, baby yet first steps towards maturity in the life called MBA. All minds after returning from ‘Pooja’ holidays were set on taking ourselves to the next level. A sense of responsibility developed for each other. The graph of overall development went up and only up. The bond with DoMS became stronger and so did the friendship among batch mates and with seniors. Currently in the second trimester, the 36th batch is having, what we call, an exquisite time that is not only vivid in terms of knowledge but also exotic in terms of experience. 2014, towards the end has filled us with nostalgia, made us realize that time is running fast and there is much to be accomplished. The mere thought that each passing day subtracts a day that we are meant to spend in the beautiful campus of NIT,Trichy makes us sad. But then, that is life, all days end and are followed by new ones full of exciting opportunities. Thus we look at 2015 as a year full of dreams, hopes and resolutions. We welcome the year 2015 with a warm heart hoping to give our best and make it yet another memorable one in the history of DoMS! Wish you all a very warm, joyous and happy new year 2015! Today on a very warm Sunday, students of DoMS -NITT sat through a lecture by the Chief Manager of Bank of India, Cathedral road , Chennai, his rich experience of over 26 years reflected in his lecture. 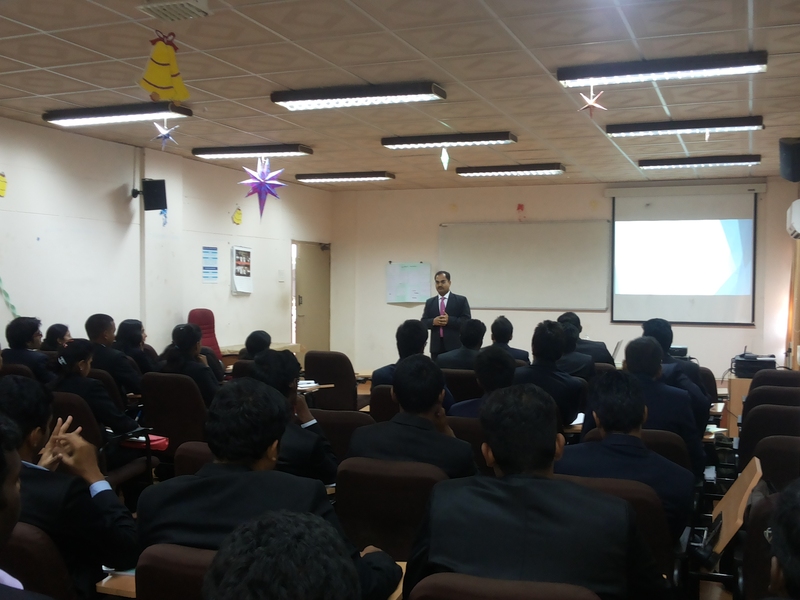 The students had the privilege of learning from him the real time working of the banking industry , basics of banking and also some interview tips and techniques. The talk was spiced up with his experience. He also gave some valuable suggestions and guidance which are certain to be remembered for a long time.